During a faceoff involving this card, if you would put any number of flipped cards on the bottom of your deck, you may banish them to beneath this card instead. Pay 1 action token to put a card from beneath this card to beneath a Friend with Pumped. 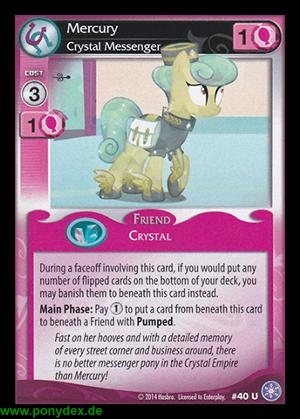 Fast on her hooves and with a detailed memory of every street corner and business around, there is no better messenger pony in the Crystal Empire than Mercury!